The year 2019 is right around the corner. It’s time to plan for big changes for your business in the year coming ahead, changes that will hopefully lead your business to brilliant new heights. One of the best decisions that you can make for your business in the new year is the decision of going paperless to a major extent, implementing paperless solutions as widely as you can within your organization. While one year may not be enough to wholly adopt the paperless approach, it’s still more than enough to get started in this direction. As you embark upon this paperless journey, you are going to need e-signatures to make paperless business processes a reality. Electronic signature solution enables you to give up the traditional style of signing using paper and pen and progress towards a better, improved way of signing. Let’s learn more about e-signatures. You will find many definitions of electronic signatures. What these definitions are basically trying to explain is that an e-signature is an electronic form of data that can be used for the purpose of signing an electronic record or document and will have the same validity status as that of the handwritten signature provided that it conforms to the applicable legal regulatory requirements. The e-signature is a unique mark in an electronic form that verifies and validates a document, in the same way as a paper-and-pen signature would. Adoption of e-signatures has been on the rise for quite some time now, especially for legal, government, and business documents. Don’t confuse electronic signature with a digital signature. Although these two terms are often used interchangeably, they hold different meanings with the key difference being that digital signatures involve cryptography. How Can E-signatures Benefit Your Business? If you have a team that’s spread across different locations in the country or globe, or you have clients who belong to different corners of the world, then you know the need and importance of seamless collaboration between all the parties. E-signatures make remote signing and document authentication possible. A person can be situated halfway across the world from you, and you can still get documents signed by them within minutes or seconds. No need to scan or mail the document, you can get straight to signing with e-signatures. There’s nothing complicated about using electronic signatures. From uploading the document and sending it to the relevant parties to the part where one electronically signs the document, e-signatures keep everything really simple and straightforward. In fact, using e-signatures is even simpler than picking up a pen and signing on a piece of paper with it. Because e-signatures are so simple to use, anyone can learn how to use them quickly and easily. It’s no fun having to deal with extensive amounts of paperwork on a daily basis. A lot of valuable energy and time are lost in managing the paperwork, energy and time that could be much better spent elsewhere. The more paperwork you accumulate, the more storage space you need to pack it all away. Anytime you have to refer to a document, you need to go through piles of papers in order to access that document. But with e-signatures, your documents can remain in digital form throughout their lifespan. They can be created online, signed online, and stored online. At no point will you need hard copies of the documents, which consequently means no messy paperwork to deal with. Your paper documents are not as safe and secure as you might think. The documents are prone to get stolen, misplaced, destroyed, tampered with, and so many other threats. On the other hand, e-signatures are able to offer much greater security and safety for the documents. E-signatures implement superior security protocols to send, receive, and store your electronic documents. Also, e-signatures don’t just facilitate document signing but they also record all the necessary evidence related to the signing transactions to ensure extra authenticity and credibility for the transactions. How much time does it usually take for a paper document to be signed by 4-5 parties? Depending on how far or how near all the parties are located to one another, it can take anywhere from days to weeks for the document to be signed off by everyone. It’s evident how excessively time-consuming things can get with paper-based signatures. Using e-signatures, the entire signing process can be completed within minutes or seconds. People who need to sign may be located far away from each other, but they can still collaborate and sign the document in a very short amount of time. As a result, your business enjoys huge time savings. It’s worth noting that saving so much precious time in business can be immensely beneficial, which brings us to our next point. Enforcing decisions in business usually has to undergo a long phase where several documents need to be signed and approved by varying stakeholders. Naturally, the more time the signing and approval process will take, the more time it will take for the decision to be implemented into action. It’s not uncommon for even good business decisions to simply get lost amidst all the formalities and lose their momentum over time. If you want to shorten the gap between a decision and its implementation, then you need e-signatures to speed up the formalities surrounding the approval process. With the relevant stakeholders quickly signing off the requisite documents with electronic signatures and giving the decision their seal of approval, you can put the decision into effect much more quickly. Every dollar you save in business matters. It is the smart cost savings here and there that eventually add up to make your business more profitable in the long run. E-signatures help in making your business operations a lot more cost-friendly. You no longer have to spend a large sum of money on paper, or on other related things like printing, xeroxing, couriering, and so on. The money saved here can be used to explore new opportunities for growth. Keeping clients happy is vital to running a successful business, and e-signatures is the key to achieving higher client satisfaction. Through e-signatures, you are offering your clients the ability to sign anytime they want, anywhere they want and using any mobile device they want. The signing experience becomes so much smoother and more streamlined with e-signatures. Your clients will certainly appreciate this new ease of signing documents. Increased paper consumption places tremendous stress on the environmental resources, whether it’s the usage of water or cutting down of trees for paper making. The need to reduce paper usage for the sake of the environment is real and urgent. If you want to make your business more eco-friendly, then e-signature is a powerful tool that can support your efforts. By adopting e-signatures you are not only ensuring progress for your business but are also contributing to saving the environment by significantly reducing the paper consumption of your business. It’s a win-win for you as well as the environment! 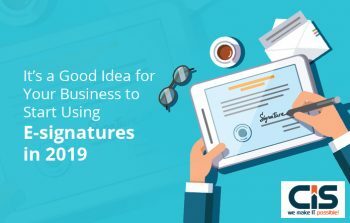 Now that we’ve discussed the several benefits that e-signatures offer for a business, you know why incorporating these into your business is indeed a great idea. You can take a step forward in the year 2019 with e-signatures and experience all the great benefits for yourself. As the Founder and COO at Cyber Infrastructure (P) Limited, it is my aspiration to drive our global clients ahead in the competitive technology world by enabling them to receive huge financial and operational benefits in software development through my years of experience and extensive expertise as technology adviser and strategist. In my current position at CIS, I spearhead management of various technology initiatives, expansion of our technology capabilities, and delivery of quality excellence to our clients.